Born in 1975, the eldest of four children in the Ganburged Family, Munkhchuluun is ten years older than Bukhu (our friend and ‘adopted’ son, Mongolian Throat Singer and Morin Khuur player). For more information on how Paul is connected to Bukhu CLICK HERE to go to BLOG – When life throws you a curve ball and for Bukhu’s music CLICK HERE to go to his website. When Munkhchuluun was three years old and being minded by friends, she fell on the electric cooktop causing severe burns to 87% of her body, mainly her torso. Not withstanding the permanent physical scars, she was finally pain-free by the time she was 12. At University, she chose to study Physical Education because she knew that exercise had been crucial to her ‘recovery’. Munkhchuluun graduated with a degree in sports journalism, going on to marry a nice bloke. At the age of 23, she got ‘blood cancer’ – probably leukemia. She had the usual chemotherapy, radiotherapy, hair loss, sick-as-a-dog cancer. The scarring from her childhood accident caused unforeseen complications, requiring surgical interventions. For the first 18 months, she could not get up because of the pain. The doctors told the family, “Sorry, but your daughter will not live”. However, amazingly, one day “she just got up!!”. The doctors were astounded, bewildered. The family unimaginably ecstatic. After three years, she was able to go home from hospital, though her condition is unpredictable, and even now Munkhchuluun needs to have six-monthly check-ups. 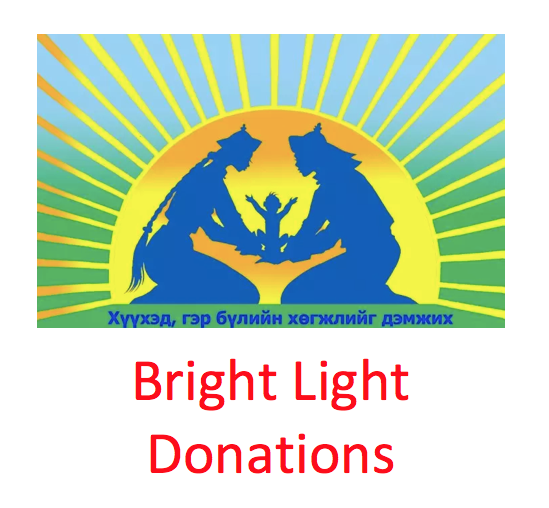 Five years ago, Munkhchuluun started the Bright Light Organisation. Initially, she had decided to help young children, remembering how difficult it was for her as a child to be so disabled and in constant pain. However, it became clear that without supporting the whole family, helping a child in isolation was not effective. It also became evident that female, single-parent households needed the most assistance, to help themselves and their children. Hence the birth of the Bright Light Organisation. Currently Munkhchuluun lives in Ulanbaator, with her husband and son, working as an archivist in the Mayor’s Office. When not at paid work, she is the bright light for the Bright Light Organisation. CLICK HERE for the BLOG – Charity Begins at Home…in the ger! Posted in BLOG on December 16, 2015 by Admin. ← Charity Begins at Home …… in the ger!